She greatly enjoys being a veterinarian particularly when she is working on complex internal medicine cases, educating clients on preventative healthcare for their pets, gently approaching geriatric cases and integrating Veterinary Traditional Chinese Medicine and Acupuncture into her holistic approach. 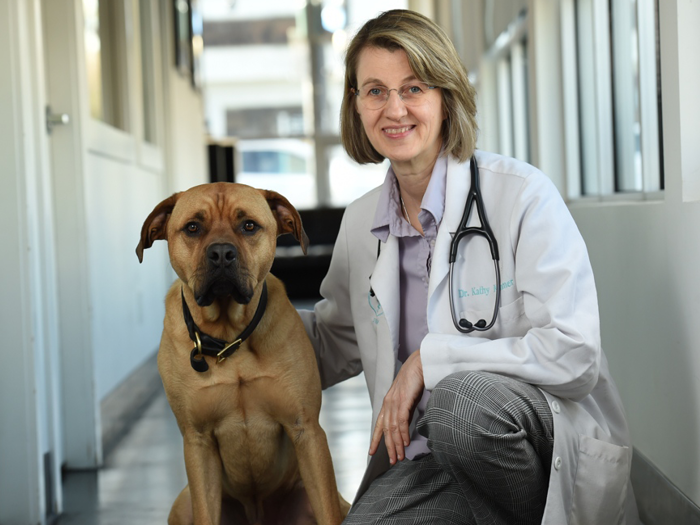 As an integrative veterinarian, incorporating cannabis in her practice has been a natural progression and has resulted in her becoming a vocal proponent for research and the use of cannabis as a therapeutic agent for companion animals. Dr. Kramer is a Diplomate of the American Board of Veterinary Practitioners (Canine and Feline Practice) and a member of the College of Veterinarians of BC, the International Veterinary Acupuncture Society, The American Association of Feline Practitioners, the International Veterinary Academy of Pain Management. She serves as the chair of True Leaf Medicine International Ltd.’s Veterinary Advisory Board, and as a director of the Canadian Association of Veterinary Cannabinoid Medicine. Dr. Kramer and her husband Alex share their home with Eddie, Vonnegut and Sal, three very handsome black and white cats.